Screen 1. As well as traditional analogue waveforms and complex tables, there are some interesting highlights like Karplus-Strong: a source of animated plucks and percussion. We explore Reason’s new flagship synth: Europa. In the early sealed world of the Reason Rack new versions generally centred around new devices. Rack Extensions changed all that, and we’ve had a few years of updates that have developed the app’s core DAW functionality. So it’s really exciting to get an old-school device drop that raises the baseline instrument list for all users. 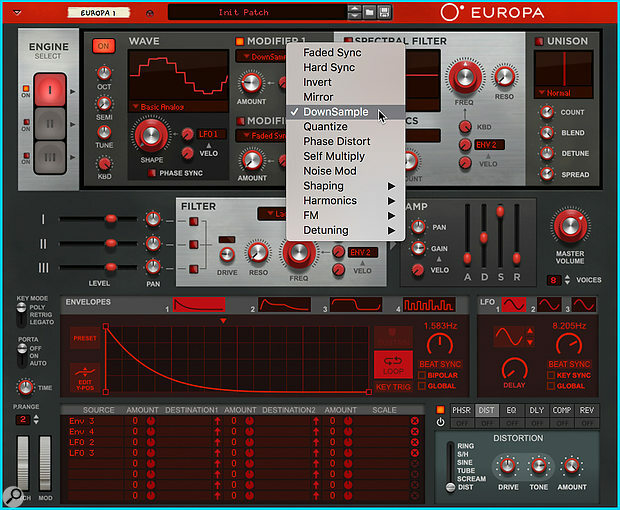 Reason 10 has two new A-grade synths: Europa and Grain. Grain is an absolute beauty: a granular scanning synth which uses any sample as its sonic starting point. We’ll return to it soon. Europa is a versatile, general-purpose synth that takes over the top-dog spot from Thor. Despite the possible name connotations, it’s neither a Jupiter clone nor modern modular, it’s at heart a wavetable synth with multi-stage sonic shaping and modulation powers. Europa has three identical voice engines, although you rarely need all of them given the rich sonic range available to each. The signal path is fixed and fairly simple: there’s no user-definable audio routing as with Thor. Instead each source — which can already be harmonically rich and dynamic — can be mangled and shaped repeatedly through various stages before being spat out into the shared filter, amp envelope, and effects. The modulation matrix is the same as the one found in Propellerhead’s Parsec synth, which was itself a refinement of Thor’s patching grid. Grain has this also, and they both share the same four completely flexible multi-stage envelopes and five master effects modules (which can be re-ordered by drag and drop). Europa’s sound sources are selected and controlled in the top-left panel titled ‘Wave’. This section has a real-time waveform display, below which is a pop-up menu for selecting the wave type. In Screen 1 (above) you can see that this has a main list and some sub-folders, one of which is ‘Wavetable’. In fact they’re all wavetables, but the ones in the folder are of the type more commonly associated with wavetable synths: collections of mostly complex waveforms providing rich timbral starting points. The first four options in the list provide all the usual sonic fodder for analogue subtractive synth sounds. Sweeping through the ‘Basic Analog’ wavetable (using the Shape knob) morphs you from Sine to Saw, passing through Triangle and Square on the way. Pulse Width, unsurprisingly, gives you a square wave with sweepable width. The Saw-Triangle mode is really useful: visually a triangle wave that can ‘lean over’ in either direction until it becomes a saw or ramp, providing anything from a soft PWM-style swirl to a progressive bite. We then leave more familiar territory for some specific and characterful starting points. ‘Game’ is a series of stepped waveforms just waiting to be modulated for chip-tune bleeps. Sync’ed Sine and Formant Sweep are fairly self-explanatory, as is Electro Mechanic, which provides shaped sine timbres for electric piano sounds. Then things get more interesting with Vocal Cord and Karplus-Strong. These waves, as well as all those in the Noise folder, have built-in movement even before you get started with other modulations. Vocal Cord is a particularly pleasing soft saw with noise and the merest hint of an ‘aah’ formant. It can form the basis of really pretty poly patches. Karplus-Strong is a toolbox for physical-modelled pluck and percussion sounds and could almost have been the basis of a synth in its own right. If nothing on the menu appeals, the Envelope 3-4 option lets you draw your own waveforms using the Envelope designer. Whatever shapes are currently set in these two envelope slots will appear at either end of the Shape control’s travel, and you can morph between the two. On board each of the three wave generators you have two switchable Modifiers that can get in and meddle with your waveforms right at the source. Screen 2 shows the range of options, again with some sub-foldered families. There are various ways that you can simulate transformations and cross-modulations of the oscillator with itself, such as Sync, Multiply, Invert and Mirror. You can also down-sample, bit-crunch, phase-distort and modulate with noise. It’s an over-simplification to say that the Shaping options are varieties of drive and distortion, but that’s part of it. The glorious thing is that you can see exactly how the modifiers are operating on the waveform in the display. It’s informative and fascinating to just start with a sine wave then flick through the modes and see exactly what they’re doing. Harmonic partials of various intervals can be added with the Harmonic Modifiers. Alternatively there are five ratios of FM you can apply for anharmonic glassy tones and bells. Finally, the Detune folder supplies unison timbres. And if you can’t choose just one, both Modifiers offer all the same modes, so you can have your cake and eat it. Screen 2. 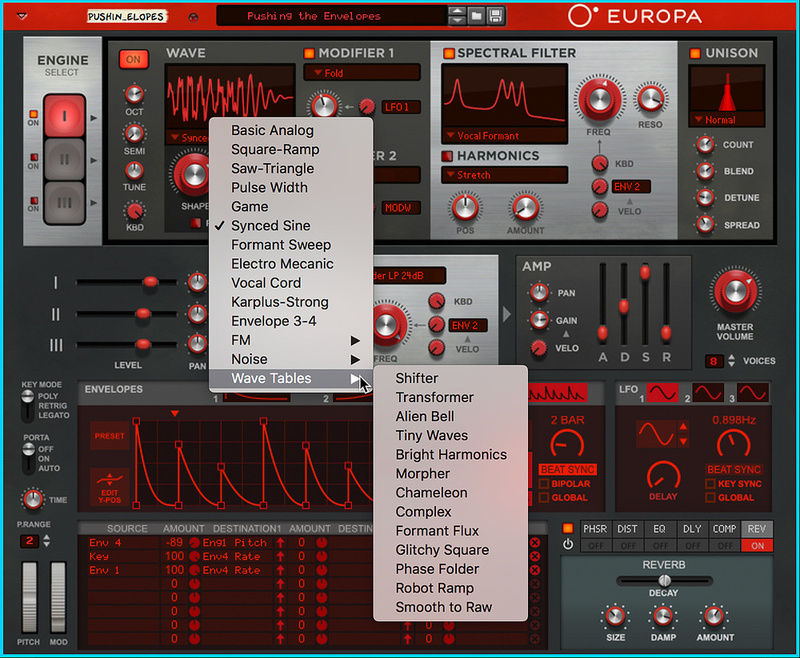 Europa’s Modifiers and Spectral Filters directly manipulate the wavetable engines, enabling a range of sounds impossible in a traditional synth. As you can imagine, all these options can quickly lead to a very harmonically complex starting point, which Europa tempers with some serious filtering power. The Spectral Filter has a host of modes, all of which can sculpt your source sound partial by partial by re-generating the wavetable. All the usual filter flavours are represented as well as Combs and Resonance filters. The Dual Peak and Formant filters are particularly useful, both re-purposing the Resonance control to adjust the shape. As with the oscillators, you can build your own filter type via the Envelope designer. Paired with the Spectral Filter is a Harmonics section which further moulds the spectral fingerprint of the signal. This is shown superimposed on the filter shape display, but operate whether or not the filter is enabled. The Position and Amount controls let you shift this harmonic template around and adjust its intensity. The Ensemble and HF Noise modes have built-in movement. As with the Parsec synth, there’s a Stretch mode that moves the intervals between the harmonics with really interesting results. The last port of call for each engine before it’s mixed with the others is a Unison effect. This is a true Unison rather than the sonic flavours in the wave-shaping engine, and can spread the voices for nice wide stereo sounds. Variable tuning, blending and voice count allow this to be used subtly, or to create giant crowd-pleasing leads. A traditional multi-mode filter can be applied at the final stage, and you can choose which of the voices will pass through it. This is great for adding some nice fat warmth, and for creating traditional analogue synth patches. Even if you leave the filter completely open many sounds get a nice boost from passing through the filter with the Drive setting up a bit. Often with wavetable synths, modulation is key to transforming bright, angular starting points into big organic sounds. Europa is brimming with modulation capabilities. There are three fairly standard LFOs, all of which can be beat- and key-sync’ed. The four envelopes themselves can also be pressed into service as custom LFOs by putting them into Loop mode, again with sync options. All these modulators have global modes, allowing you to keep them in sync across multiple voices. Envelopes can be created in any shape you like, or there are a number of presets. By double-clicking on an envelope graph you can add breakpoints, which you can then drag around freely. The Interconnecting gradients can be curved by clicking and dragging. If you want a Sustain stage, you enable it from the button, then place the marker on the point where you wish your envelope to pause. If you prefer to sketch your own Envelope freehand, hold Command (Mac) or Ctrl (Windows) and draw straight into the graph display. With both Europa and Grain, custom envelopes are incredibly handy for making sounds move in exactly the way you want. You can manually play with controls to find a nice dynamic effect, then automate the same move by making an envelope that does the same thing. It’s surprising how limiting a traditional ADSR feels afterwards. Europa has a mod matrix, but adding movement is much easier thanks to the addition of local modulation assignment controls on many key parameters. The Wave Shape position, and both filters, are pre-assigned with modulation sources, and you can add velocity scaling via dedicated knobs. These assignments are not fixed: you can click on any of them and choose from the list of all modulators and performance inputs (velocity, key scaling, mod wheel, etc). The mod amount knobs on these local controls aren’t bi-polar, but you can choose inverted versions of the mod sources from the list. Complete control of modulation (and routing of CV inputs) is available in the matrix: it should be simple to understand if you’ve mastered Thor or Parsec. Each ‘slot’ enables you to assign sources to one or two parameters, set the depths, and then add another mod or data source to scale the mod amount. There are some interesting options to explore such as combinations of the modulators and a random source. The Polyphony source is also useful for trimming the gain of patches that distort when you hold lots of keys. With just the tiniest touch of modulation to the Wave Shape you can create lovely, interesting patches that move and swirl, or you can slam rhythmic envelopes into the Modifiers for intense dubstep nastiness. Reason’s new synths should give us plenty to get our teeth into for the months to come.